It’s been an interesting couple of years with nothing but a maxed-out MacBook Pro 17″ as my only home machine. The hard drive died but time machine held my hand. At ALT.NET Seattle 2009 my backpack took a dive that left a dent in one corner. The battery was replaced and I roped GrinGod into obtaining a replacement UK-style \ key from the UK after some frantic typing. A friend cracked the display when his key-fob sprang from his Batbelt culminating in a visit of the Apple Store in Bellevue. Ten days and $700 later got that fixed and included a bonus disconnected thermal sensor, a couple of new scratches, an extra screw to rattle around inside and a line of grease around the Apple logo. When I find myself eyeing the unibody I wince at the glossy ‘matte finish’ screen, the multi-touch track-pad clicks that sound like Robocop is nearby and a US keyboard that requires my pinkie to hit a single-height enter key. That little pink dog won’t learn any new tricks. I’ve tried. Still the OpenCL benchmark show the 8600M outperforming the newer 9400M and it does everything I need and at least one thing I don’t (gets hot enough to bake bread on). Short of switching the hard disk out for an SSD – I’ve ordered twice and then recalled after a Twitter volley of “no, you don’t want THAT one” – it’s here to stay for at least another year. One thing that is always changing is the bunch of installed applications as I search for a combination that deliver a nirvana between productivity and enjoyment. Apps that perform a set of focused useful tasks with a shiny, eminently lick-able user interface, score highly. I’ve rounded up my favorite apps before but here’s the latest specials on the menu. This great-looking app helps reclaim wasted space making it a pre-requisite for SSD switchers. Combining the PowerPC and foreign language code-purging of XSlimmer & TrimTheFat is also adds cache & log purging in with application uninstalls ala AppZapper etc. This year I rewrote my blog’s WordPress theme from scratch and given the PHP requirement I found myself looking for an alternate IDE to Visual Studio. I already own TextMate but the feel of a raw text editor with bundles of extra bits feel didn’t have the gloss and usability I wanted such as fast preview, remote FTP sync etc. with a minimal of setup fuss. I briefly toyed with Espresso during the early development cycle but Coda won me over in the end with it’s sheer simplicity and elegance plus the addition of built-in documentation for PHP was very helpful when working offline. Yes, when the Magic Mouse hit the street I picked one up. The idea of a mouse with track-pad multi-touch technology was appealing but a few minutes of use and no amount of twiddling would make it track or let me configure it to take full advantage of what it should be able to do. Until Apple sort this out BetterTouchTool is your friend letting you speed up the tracking of the Magic Mouse, or indeed your track-pad, and assign all sorts of interesting shortcuts and abilities to combinations of finger gestures. Mac apps tend to expose only the common options in their user interfaces but sometimes developers add some additional tweaks and settings behind the scenes that live in the Mac’s equivalent of the registry (known as “defaults“). While you can set these manually using the defaults command-line tool you still need to know the setting exists, it’s name and what options are available and so secrets exposes this. Secrets is similar to Deeper and TinkerTool but the difference is that the secrets web site lets people add new options which then are automatically available within the installed preferences pane making them easily discoverable, searchable, applied… and occasionally undone. This point-and-click adventure game will appeal to people who enjoyed Monkey Island although it feels more like the gorgeously submerging Beneath a Steel Sky. 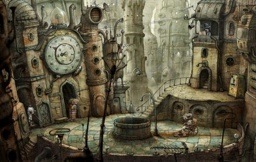 The scenery is brilliantly imagined, stylistic and shows that very real lived-in cities can be beautiful especially when populated by cute robots capable of assembling themselves from their own body-parts (just like a triple 8 but infinitely cuter). I came home from work today to find my family pack upgrade version of Snow Leopard. It’s been a few hours, so here are impressions so far. The packaging was very small and lightweight and eco-friendly compared to the big-plastic-box-monsters that come out of Redmond. Installation went mostly smoothly apart from an abort-and-restart that seems to have been caused by my DVD drive flaking out on me. It’s been trouble since it came back from the Apple Store. I had to run the separate Xcode installer to update that – it wasn’t automatically detected – which left me wondering if I need to manually install anything from the optional installs or not. Running Xcode before updating it not only failed to launch but left a background process I had to force quit with Activity Monitor to let the installer upgrade it. The less-is-more-approach followed through to disk space which freed up another 10.5 GB – impressive given that I had purged all the non-English language resources already using Monolingual and I elected to re-install the Rosetta PowerPC binary support. 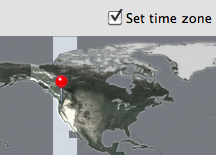 Great for traveling users like myself, it found my nearest city instantly. Gone are the Automatic, light, medium and strong options replaced with a single “Use LCD font smoothing when available” option that isn’t too good at detecting third-party displays but you can activate the old hidden options. The rendering just looks plain wrong when booting. It has that awful color-fringe that you see from time to time, the cause of which seems to be related to the default gamma (the curve on which digital colors become analogue levels) on Mac OS X changing from 1.8 to the PC compatible 2.2. It seems however that the sub-pixel rendering algorithms haven’t been updated to correct this. There is absolutely no point in posting a screenshot as either your browser, screen or OS would make it appear different to how it did here. Help is at hand though, you can head into the ColorSync Utility in your Applications folder and calibrate your display – just follow the instructions and set the gamma back to 1.8. It’s worth turning on “Expert” mode and spending a few minutes setting it up properly though. I used to love opening up other people’s NIB files. You could in theory create your own customized versions of an applications interface. Localize it for yourself. Maybe even create a UK English version where Colour is spelt correctly. Whether this was to save space or to prevent such hacking is anyone’s guess. Login Window keyboard shortcut – come on, seriously, with the secrecy at Apple surely you need this too? Grab – STILL only saves in TIFF format. So I save it there, load into preview then into PNG. WTF?? Apple needed to replace the aging Monaco as it has poor international Unicode support, has just a single style and poor hinting (it uses embedded bitmaps to look good without anti-aliasing in Terminal). Given Steve Job’s apparently love of typography would they commission a gorgeous new monospaced font as Microsoft did with Consolas? No. 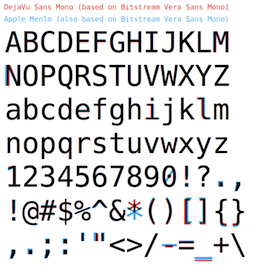 In 2003 Bitstream released the family Bitstream Vera under a free license which included a great Sans Mono with bolt, italic and bold-italic variants. It even has some capable hinting so looks pretty good without anti-aliasing although could do with a few delta’s to clean that up. While it was short on the Unicode support several forks filled in the gaps such as Deja Vu and Apple took Vera Sans Mono, grabbed some of these additions (adding 2900 glyphs) and tweaked some of the existing ones. Specifically they moved the vertical bar up on EBH, widened MN, shifted il, changed 0 from dotted to crossed and move/resized punctation then packed it up in a True Type Collection file that stores multiple TTF’s in a single file. While these changes themselves look quite good – it seems they were optimizing for 14 point – in the process they destroyed the hinting for these glyphs despite the tiny amount of change made. Spot which ones Apple modified on these screenshots (curiously Windows refuses to use the TTC file as it believes it is corrupt). Apple is obviously aware it’s not a good job as the option to turn off anti-aliasing in Terminal when using Menlo is curiously disabled – this seems to be something hard-coded into Terminal.app as it doesn’t affect TextMate. Installation here was a little tricky as initially the installer told me that Boot Camp 64-bit was not supported on my computer model. Whether they don’t support 64-bit Windows on a late 2007 MacBook Pro 17″ (MacBookPro3,1) or whether it was complaining about Windows 7 isn’t clear as there are no Windows 7 specific drivers on the disk. All is not lost however as if you navigate into Boot Camp\Drivers\Apple folder you can run the BootCamp.msi or BootCamp64.msi from there and it does not seem to perform the check. All the drivers installed without complaint and the track pad, mouse, audio etc. is working just fine. But the downsides are also worth noting, all of which make me think when I replace my 2.6GHz 17″ MBP in a year Apple aren’t going to have something I want to replace it with. Me.com was up, briefly, just long enough for me to grab my usual handle and get the confirmation message in fact. I did get a brief glimpse of the UI complete with a Finder-like view of various folders once I clicked past a warning about Internet Explorer 7 not being supported. Seconds later things stopped responding and then the original placeholder was back. It’s no secret Apple have been using the SproutCore framework in producing Me.com and that while SproutCore isn’t tied to Ruby on Rails it seems likely Apple went with Rails given the lack of interest in WebObjects and more and more Rails articles turning up on ADC. If they’ve gone down that route I’m hoping we’re not in for a ride like the Rails powered Twitter one takes us on. Despite being relatively simple functionality it has been unable to cope with the demand and ability to scale which means downtime, slowness and features being switched off are regularly observed. 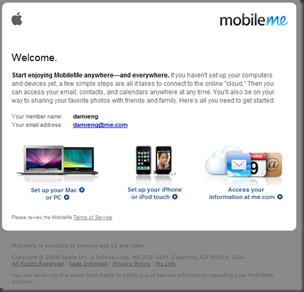 They are using WebObjects after all so expect some WebObjects and SproutCore integration love soon. As an aside I’m in the US the week after next to meet my team and attend some training and will try and grab an iPhone 3G whilst there if not already sold out. Given that I’m only in Canada for 3 more months I don’t want to be trying to escape Roger’s expensive 3-year contract so soon.